Great gift… Stocking stuffer…. 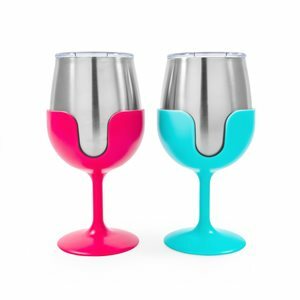 Camping accessory… The Life is Better at the Campsite Painted Tumblers offer superior heat and ice retention. They are constructed of durable, kitchen-grade 18/8 stainless steel and come with a BPA free lid. The double wall vacuum insulation and built-in gasket help prevent heat transfer, meaning your ice stays solid longer and your cup won’t sweat. 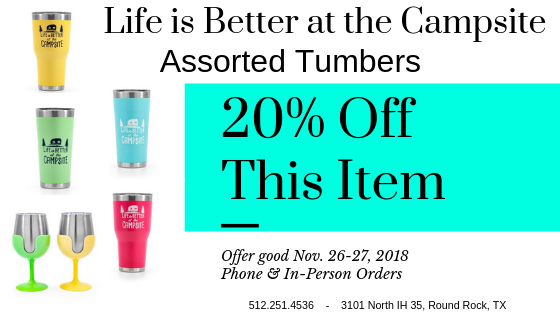 This tumbler comes in 2 sizes, a 20oz. or 30 oz, both designed to fit in most cup holders! 4 awesome colors… pink, blue, yellow or green. Flat bottom on stem and on stainless steel cup so you can use it with or without the stem! Anybody who enjoys the outdoors will love these! Need a camper to go with those beverages?